We wanted to take this opportunity to wish our dedicated blog readers and their families a joyous Holiday Season and Happy New Year. As we say good-bye to 2008 - a year of major challenges in the housing and construction industry, but one in which we found new opportunities in California and have actually grown in the last half of the year - we are excited and look forward to what 2009 will bring! Cheers! Barrier management has identified Wildfire Zone applications of Blazeguard® Fire-Rated Sheathing as a key area of focus for 2009. At the start of this year, the state of California adjusted its building codes to address the use of fire-retardant materials in Wildland Urban Interface (WUI) areas of the state. Nationally, the International Code Council convened a blue-ribbon panel to address WUI concerns. 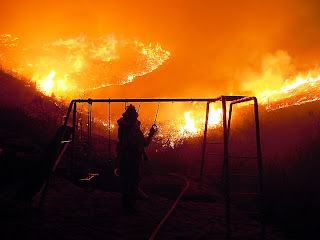 Against this backdrop, southern California experienced a rash of highly publicized and damaging wildfires in October and November. In July, Blazeguard Fire-Rated Sheathing was added to the California State Fire Marshal's WUI Products list as an approved product for exterior wall siding and sheathing, for under-eave construction as an ignition-resistant material. Barrier is working with distribution partner Bear Forest Products to deliver product to California for use in wildfire zone construction. Earlier this month, Barrier CEO, Michael Huddy, visited California to meet with Bear Forest, present Blazeguard to a committee of the American Institute of Architects' Inland Empire (Southern California) chapter and to meet with architects and builders who are currently specifying Blazeguard for use as exterior sheathing on two houses - one in the Monterrey area and another in Napa. Barrier will promote these projects to architects, builders and designers throughout California. Dr. Huddy has also been asked to present on the use of building materials in WUI zones at a national fire-safe building conference in Chicago in April. Barrier products are heading north for the winter - north to Alaska, that is. Mule-Hide FR Deck Panel distributor Okaply has received its first rail car load of panels for inventory in its Edmonton, Alberta yard. The panels are used in commercial modular applications where a Class A or Class C assembly is required; while this inventory will supply a commercial modular customer in Alaska, Okaply is also introducing Mule-Hide panels to other manufacturers throughout Canada. Barrier is pleased by Okaply's distribution commitment to the region and excited about prospects for further growth throughout both Alaska and Canada. Barrier has secured a gold level sponsorship at the Structural Insulated Panel Association (SIPA) booth at the 2009 International Builders Show (IBS) January 20-23, 2009. Produced by the National Association of Home Builders (NAHB), IBS is the housing industry's largest annual gathering. The 2009 IBS will feature more than 1,700 exhibitors displaying the latest in home and building products and services representing more than 250 industry categories. IBS also hosts 250 educational seminars on topics ranging from green building and design trends to construction codes and 50+ housing, as well as home tours and special events. NAHB estimates 90,000 industry professionals will attend the 2009 IBS. Barrier will be presenting Blazeguard® Fire-Rated Sheathing solutions for the Structural Insulated Panel (SIP) industry. As a 20-minute thermal barrier on the inside face of a SIP, Blazeguard offers SIP-builders a factory-applied, code ready solution to fire resistance needs for panels in residential and commercial construction. The Blazeguard booth will be constructed largely from Blazeguard-coated SIP panels. Barrier will also be distributing its latest White Paper: Fire-Resistive Treatment of Structural Insulated Panels (SIPs) for Commercial Roofing Systems -- at the 2009 IBS. The Structural Insulated Panel Association (SIPA) is a non-profit trade association representing manufacturers, suppliers, fabricators/distributors, design professionals, and builders committed to providing quality structural insulated panels for all segments of the construction industry. Barrier is an active member of the SIPA's residential and non-residential marketing committee as well as its supplier committee. As part of its gold level sponsorship, Barrier has secured a limited number of free four-day exhibit passes (non NAHB-member price is $200 per pass). Barrier customers, business partners or blog readers (!!) who would like to attend the IBS in Las Vegas in January are invited to contact Barrier at (800) 638-4570 or info@intlbarrier.com with a request for passes.